Catchmaster Glue uses a unique sticky formula designed to trap a variety of rodents regardless of temperature. 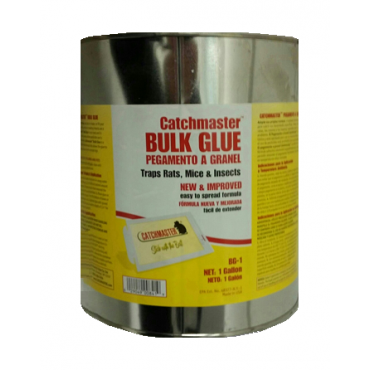 Catchmaster Glue is designed to increase the effectiveness of pretty much any existing glue traps or for special circumstances and trapping unusual pests. Catchmaster Glue is a product by Bell Laboratories. FOR RATS AND OTHER LARGE RODENTS - Place glue boards 10 to 15 feet away from each other. Keep them in place for at least five days before moving to other locations since rats and rodents may avoid these areas until they realize the glue board is a new permanent fixture. Either fasten the glueboards using wire or use Hercules Putty to hold the glue boards still so rats cant wiggle free. FOR MICE, MOLES, AND OTHER SMALL RODENTS - Put glue boards at a space of 5 to 8 feet apart. A mouse will limit the range they cover so to increase mouse activity and glue board success move things around where they have been spotted, which will make the mice explore to find out whats going on and what is new in their surroundings.